When you provide personal information on a QA forum. you may be asked to enter your: name or e-mail address. pfGuru.com makes use of log files,like many other Web sites. The information logged includes internet protocol ( IP ) addresses, type of browser, Internet Service Provider ( ISP ), date/time stamp, referring/exit pages, and number of clicks to analyse trends, administer the site, track user’s movement around the site, and gather demographic information. IP addresses, and other such information are not linked to any information that is personally identifiable. We do NOT sell, trade, or otherwise transfer to outside parties your personally identifiable information. However, non-personally identifiable visitor information may be provided to other parties for marketing, advertising, or other uses. we take necessary security measures to protect against unauthorized access, alteration, disclosure or destruction of your personal information, username , password, and any data stored on our site. pfGuru.com cares about the integrity and security of your personal information. However, we cannot guarantee that unauthorized third parties will never be able to defeat our security measures or use your personal information for improper purposes. You acknowledge that you provide your personal information at your own risk. We use Google Adsense Ad Network. Google’s use of the DART cookie enable it to serve ads to users based on their visit to our site and other sites on internet. DART uses “Non personally identifiable information” and does NOT track personal information about you, such as your name, email address, physical address, etc. You may opt out of the use if DART cookie by visiting the Google ad and content network private policy. This content,(including card comparisons, card reviews, credit repair reviews etc) is not provided or commissioned by the bank advertiser. Opinions expressed here are author’s alone, not those of the bank advertiser, and have not been reviewed, approved or otherwise endorsed by the bank advertiser. This site may be compensated through the bank advertiser, Affiliate Program. pfguru.com is an independent, advertising-supported comparison service. The owner of this website is compensated in exchange for featured placement of certain sponsored products and services or clicks on links posted on this website. 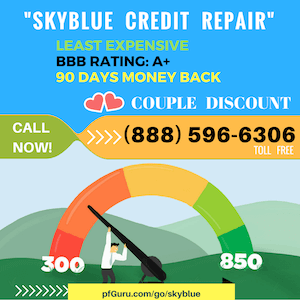 The credit card, credit repair services and savings account offers that appear on this site are from companies from which pfGuru.com receives compensation. This compensation may impact how and where products appear on this site, including, for example, the order in which they appear on category pages.pfGuru.com does not include all credit card companies, banks, or all available offers, although best efforts are made to include a comprehensive list of offers regardless of compensation. More information about us is available at About Us and Disclaimer. How to Reduce Risk for Identity Theft ?